Bun Hairstyles For Men - Do Men Look Good In Buns? Man Buns: Hipster Hot Or Just Plain Strange? Okay, we're not embarrassed to say that we go weak in the knees for that shaggy, grown-out hair that hipster men can cultivate so well. After years of the "metro" aesthetic, shows like Bored to Death, and all things Williamsburg seeping into the national consciousness, men's hair, in general, is longer. So long, in fact, that it necessitates some means of getting it out of your smokin'-hipster-man face. Hot weather, functionality, and FDA health codes all contribute to rise of a new and slightly confusion trend: the man-bun. After all, no one wants to pull out a long blond hair from their vegan organic burdock-root-and-shiitake soup, because that’s nasty, no matter how gorgeous the hair-shedder is. So, what’s the consensus on man-buns? 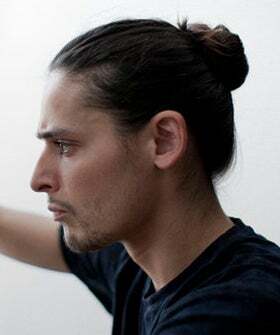 We have to say, we're torn: On the one hand, Olivier Theyskens pulls the high-on-the-head bun off better than most of the chicks we know. On the other hand: If we see one more bun comprised of hipster dreadlocks, we are going to have to resist the urge to buy a razor and slice it off. But enough about us? What are your thoughts on the trend? Weigh in in the comments.